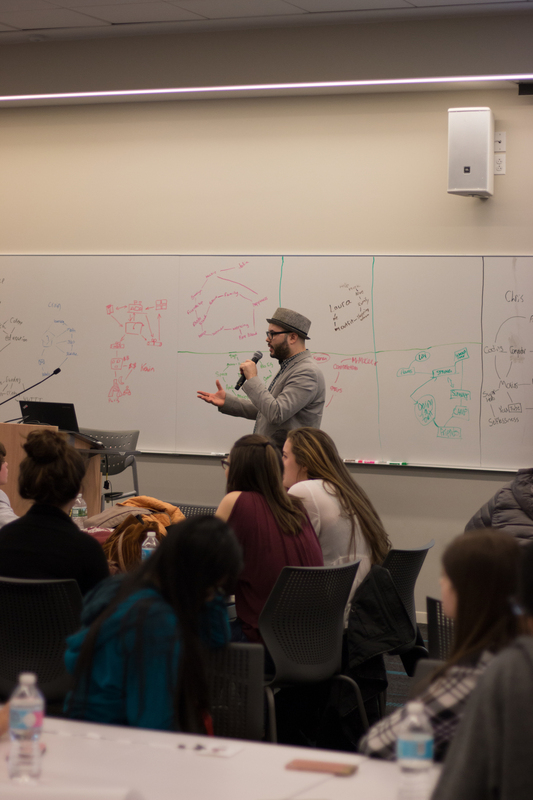 Each year, We Connect The Dots holds an event at the Microsoft offices in New York City that invites schools from around the NY Metro area to participate in a full day of immersive, experiential learning and 21st century career awareness. 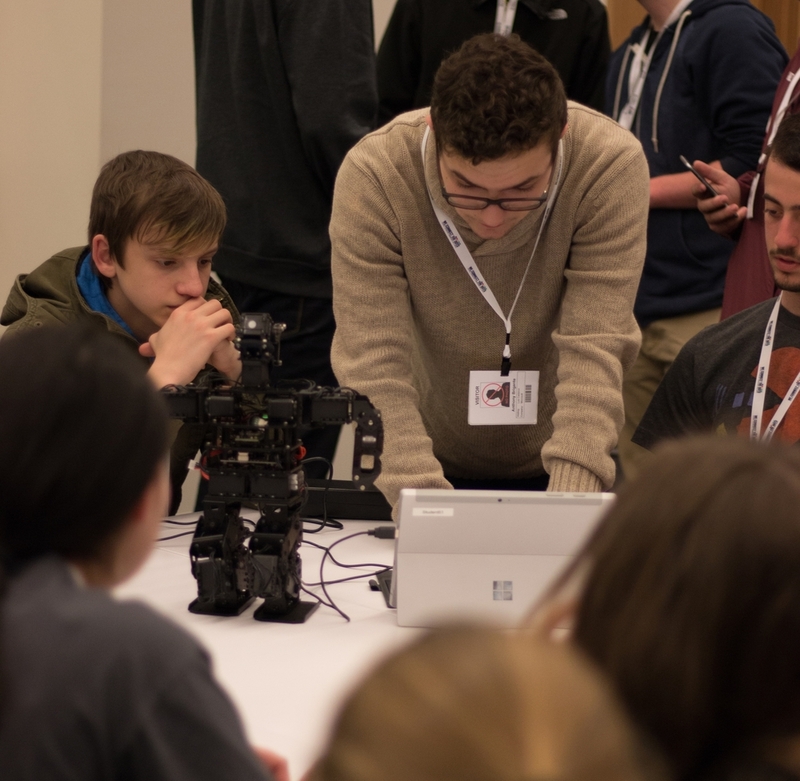 This year's program was one of the most successful Discovery Day events held since its inception, with a turnout of six different school districts, totaling at over 175 students, teachers, administrators, and professionals that joined us for this innovative program. Why is it important to hold this program each year? Students and teachers need to be kept up to date and aware of how technology is disrupting industries every day and changing future careers along the way. Each year, a student's understanding of possible career choices and the technology and resources they will use in the workforce of the 21st century shift and expand. A student without a working knowledge of software tools, development principles, digital citizenship, and the basics of computer science will find himself/herself graduating into a world with fewer opportunities across the job market. Our mission is to support school districts and students by bringing awareness to the career opportunities and the necessary skills to be successful, no matter what career path they choose, thereby providing students the opportunity to discover what might be possible in their future. The name of our organization, "We Connect The Dots", has meaning to what we accomplish on a daily basis. We connect students, teachers, industry experts, corporations, and government to create community impact by bringing resources and people together. We know from experience and our metrics the positive impact our programs create for communities. When you create the right blend of learning, fun, and novelty experience, learning outcomes are extremely positive. This is proven time and again in our programs, which place diversity, experience, and the sharing of ideas at the forefront of our pedagogy. By bringing different perspectives, experiences, and ideas to the table, we are able to create an environment that supports life-long learning for students and teachers. Teachers and administrators from Plainview-Old Bethpage get involved in the day's activities. At its heart, Discovery Day is a day-long demonstration of new technology and educational programs, but it also offers a fun opportunity for students to tour the Microsoft office, hear about different careers in STEAM fields, and participate in gamified learning experiences that demonstrate what professionals in those careers do and how they got to where they are. Microsoft Operations and Community Manager, Antuan Santana, giving students some insight as to how STEAM learning and careers will shape their futures, and what Microsoft is doing to give students access to STEAM educational resources. 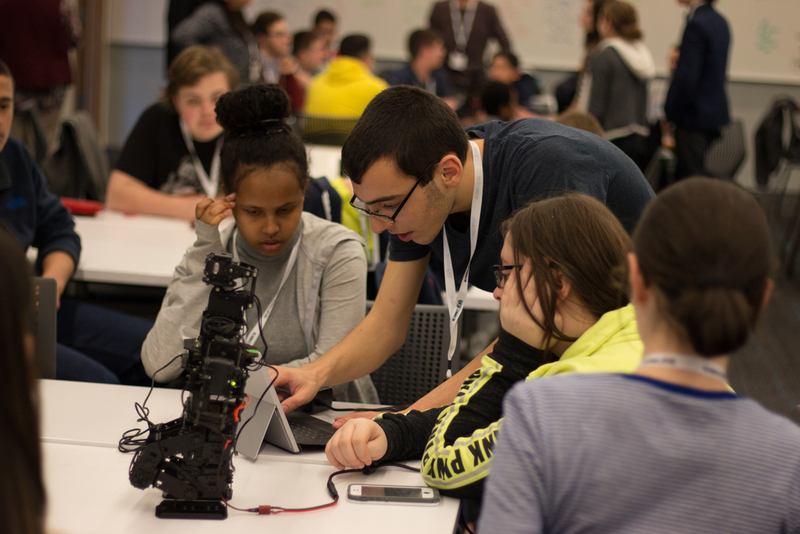 Workshops at this year's Discovery Day included sessions on robotics, coding, microblogging and social networking, mind mapping, and cyber security. 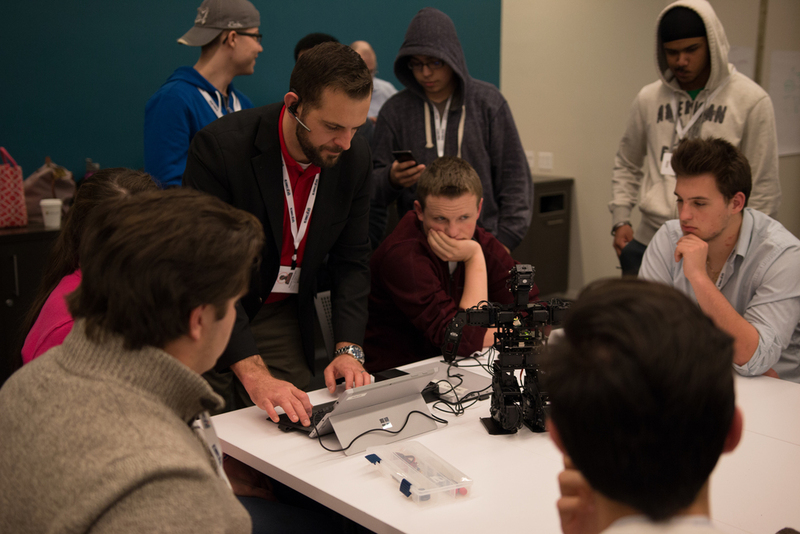 The robotics session demonstrated to students how modern robots function, how they are controlled, and how each component links together to make the robot work. Our particular robot is a Trossen Humanoid Robot called the HR0S1, which uses the Linux emulator PuTTy to allow the user to manipulate the limbs and make the robot move. The session was led by Michael Teal, STEAM Coach for WCTD, leading students through an introduction to robotics and how they continue to impact our lives. Michael Teal lines students up to exemplify the concept of a daisy chain, giving students a greater understanding of the electric configuration of our Trossen HR0S1 Humanoid robotics systems. The session on Creative Coding through Games and Apps was delivered by two of our high school community ambassadors, Anthony Brigante and Conor McCormack, who led the students through a short, creative coding session using Touch Develop. The session provided students unfamiliar with coding an opportunity to get comfortable with new terms and new resources, and followed with students working in teams to design a game. Community Ambassador, Anthony Brigante, configures a team's system before the robotics activity. A signature part of Discovery Day each year is a tour of the Microsoft Technology Center and visiting the showcase Data Center. The high tech facility is a showcase of Microsoft technology, where Microsoft displays some of its emergent technology. Students had the opportunity to see a live broadcast studio and visit the Envisioning Center where Stephen Jeffries, Technology Architect, gave the students a demonstration of the Surface Hub, one of Microsoft's newest products that offers interactive display technology on a touchscreen surface the size of a big-screen television. 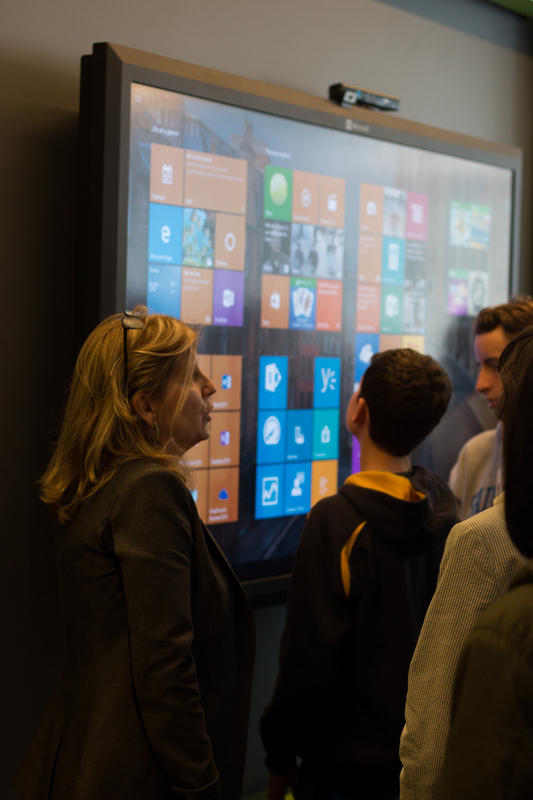 Students get an overview of the Surface Hub interactive display from Microsoft Technology Architect, Stephen Jeffries. Each year, we integrate our new curriculum development into the Discovery Day program. This provides our team an opportunity to see what resonates with students and if our content is engaging and age appropriate. WCTD is currently working on curriculum for a high school cyber security program. This program design project is our first international collaboration, and it includes input from a PhD student at Oxford University who is studying cyber security Learning, a teacher from Australia who has mastered PBL in her classrooms, teachers from the US, students from Australia and the US, as well as industry experts in the field of cyber security. The design team worked together to create a 1-hour session for Discovery Day. This session was delivered by one of the design team leads, community ambassador Brittney Segura. Brittney took the students through an overview of what cyber security is and how careers are evolving in that area, from law enforcement to identity protection to social media. Brittney then did an activity with the students that showed them how with just a little information and some critical thinking, a person could use internet resources to track down a criminal, much like the way the FBI does on a regular basis. The feedback from the teachers and students was very positive and helped to shape how the program will continue to evolve. Community Ambassador, Brittney Segura, give students an overview of what cyber security means and how it affects daily life. Visiting a Microsoft corporate office, or any hi-tech corporate office, is a novelty for many students and creates an excitement to want to learn more. We Connect The Dots would like to thank the Microsoft team in NYC for their continued support of the program and for energizing students and teachers about the possibilities in their future and for providing the free resources for students and educators to develop the 21st century skills for success.